Global Business Intelligence (BI) vendor, Yellowfin, has launched a new native application for the iPhone that, according to CEO Glen Rabie, “solves the issue” of receiving and sharing business analytics via smartphones. The application, officially launched Tuesday 3 April, is available for free download from Apple’s App Store and compliments Yellowfin’s recently released (November 2011) application for the iPad. Yellowfin for the iPhone integrates Yellowfin’s renowned ease-of-use and collaborative capabilities to deliver a Mobile BI application based on the intuitive, interactive and collaborative principles underpinning the world’s foremost social media platforms and applications. Rabie said that Yellowfin’s consumer-oriented approach to Mobile BI challenged the industry’s perception of mobile analytics, and that the well-documented trend towards user-friendly enterprise products for analytics – the consumerization of BI and enterprise IT at large – proved a major driving force behind Yellowfin’s decision to undertake the project. He also claimed that many enterprise applications and software products lack appeal, and have an enormous amount to learn from their leisure-time equivalents. Rabie said that Yellowfin had come a long way since its first iPhone application, which “didn’t provide users with a particularly engaging experience”, but suggested that many vendors hadn’t learnt the same lessons. The new iPhone application reaffirms Yellowfin’s position as a preeminent provider of Mobile BI, rounding out an impressive 18 months for the vendor, in which Dresner Advisory Services (DAS) identified it as a leading solution in two separate studies analyzing and comparing the world’s foremost Mobile BI providers. Yellowfin was also recognized in Gartner’s latest annual Who’s Who in Mobile BI report. Yellowfin’s new iPhone application includes all the ease-of-use and interactivity now synonymous with the vendor’s mobile offerings, and delivers a compelling mobile reporting and analytics experience by embracing the ‘gamification’ of enterprise IT. Users can subscribe to and save ‘favorite’ reports, filter results, drill down and through data and set alerts. The new application also embraces Yellowfin’s author once, consumer anywhere approach – any reports created via the browser are immediately ready for mobile distribution. 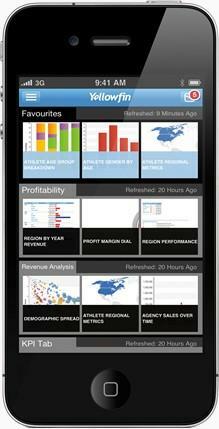 Customers gain the benefits of Mobile BI immediately. A completely restyled User Interface (UI) offers enhanced navigability and takes advantage of the iPhone’s native functionality and multi-touch interface. Users can view all their dashboard tabs and favourites with a single swipe, and a drop-down inbox allows users to control all information delivery, access and dissemination from one central location. The new UI also makes knowledge sharing easier, allowing users to comment on and email reports with a few simple touches. The ability to cache content to the iPhone enables super-fast report browsing and further embraces the notion of anywhere, anytime reporting. Data caching can be enabled or disabled depending on the security protocols of individual client organizations. Enriched analytical capabilities include the introduction of series selection and section reports. Rabie said that Yellowfin was responding to the consumerization of BI and the need for greater Return On Investment (ROI) for BI projects. The consumerization of BI – the introduction of user-friendly functionality and capabilities to support widespread BI adoption – has been noted by many analysts as the answer to improved BI ROI. Rabie said that the need to design product functionality for data consumers, rather than report writers, was even more paramount in the context of mobile analytics. Rabie added that the focus on information consumption, rather than development, was further intensified when using smartphones as the delivery platform for Mobile BI. The demand for Mobile BI is growing. As new Web-based technologies and applications meet an increasingly mobile workforce, many organizations are looking to leverage the ability to receive and disseminate reporting and analytics from mobile devices in order to stay informed, make timely decisions and boost productivity. Analyst firm IDC predicts smart device shipments to reach 1.84 billion units by 2016 – more than double that of 2011 – as businesses of all shapes and sizes around the world show a nearly insatiable appetite for smart connected devices. InformationWeek’s 2012 Business Intelligence, Analytics, and Information Management Survey disclosed that 44 percent of respondents plan to add mobile analytics capabilities, via smartphones or tablets, to their data strategies this year. A recent study released by analyst firm Aberdeen Group – Mobile BI: Actionable Intelligence for the Agile Enterprise – found that companies with Mobile BI can make critical business decisions six times faster than organizations without a mobile platform for reporting and analytics. The same Aberdeen survey found that, of the 277 participating companies using BI, employee usage of those BI systems doubled with the introduction of Mobile BI. Despite intense recent interest in Apple’s iPad as a device for mobile analytics, smartphones – particularly the iPhone – still have an integral role to play in current and future Mobile BI deployments. DAS’ most recent Mobile Business Intelligence Market Study demonstrated that a smartphone – the iPhone – remains the preferred platform for Mobile BI. Thirty-two percent of respondents to the October 2011 survey cited the Apple smartphone as their first choice platform for Mobile BI. The iPad was a close second, with 30 percent listing the Apple tablet as their preferred platform. Further, 66 percent of respondents listed a smartphone as their first choice delivery platform for Mobile BI. TechTarget’s 2012 Global IT Priorities Survey supports DAS’ findings. Thirty-four percent of respondents plan to introduce tablets as part of their corporate IT strategies in 2012, up from 18 percent in last year’s study. Despite the substantial increase in planned tablet-based implementations, 35 percent of respondents still planned to implement smartphone-based initiatives in the next 12 months. “Many organizations will continue leveraging existing smartphone devices to underpin Mobile BI deployments for practical and financial reasons,” said Rabie. 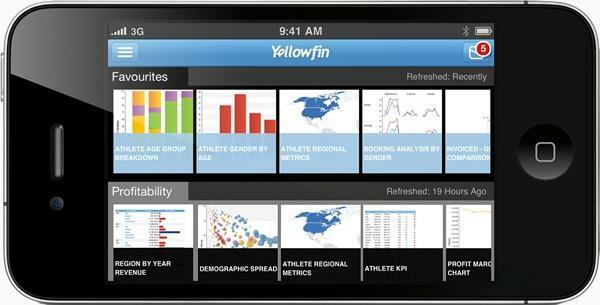 Yellowfin offers customers the ability to receive mobile analytics out-of-the-box on any device or platform at no additional cost, via native applications for the iPhone, iPad and Android platform or Web-browser.